I ventured inside the Shark House to experience the live critters in person, as well as all the other killer amenities. 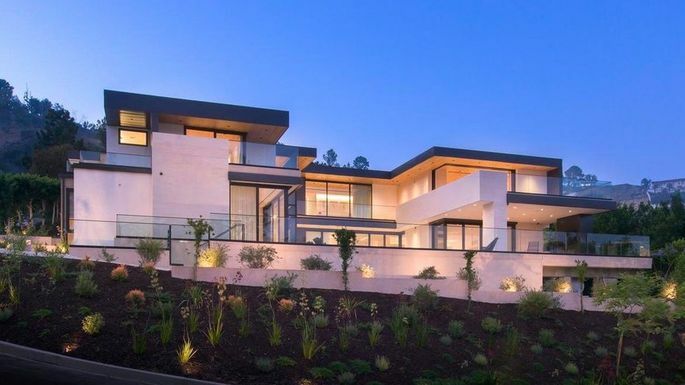 Spec homes in Los Angeles are engaged in an elaborate game of “Can you top this?” It’s no longer enough to have a negative-edge pool overlooking the city, a walk-in closet with a champagne bar, or a second kitchen for the catering team. To that end, developer Ario Fakheri hopes that the world’s only residential open-air shark tank will lure in a buyer willing to spend $35 million for his latest project. I had the unique opportunity to visit the fascinating Shark House recently, and chat with listing agent Sam Real of Nest Seekers International, about the home’s finer features. And of course, I had to step into the shark tank and sit a spell. I have to say, it was quite intriguing. 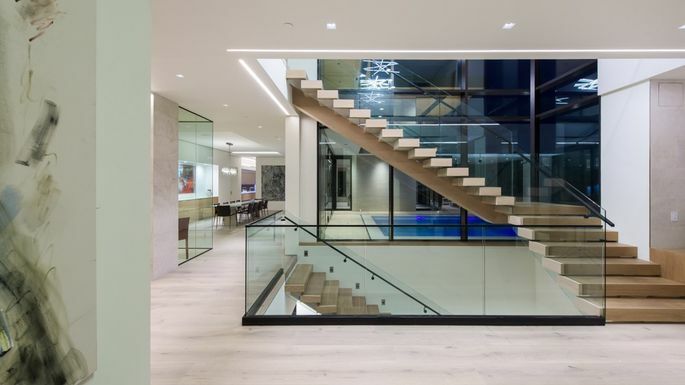 The 2.5-foot deep shark tank is situated so that residents and guests can admire it via “floating” steps placed above the water, or from the adjacent walk-in humidor featuring floor-to-ceiling glass windows. Don’t worry—no one is in danger of Jaws leaping up to chomp off a leg. Aquatic life in the open-air tank currently includes seven stingrays, one horned-back stingray, three hound sharks, one remora shark, one horn shark, one cat shark, one starfish, and three yellow tangs. But if the finned friends make you nervous, you can always take your gaze upward and enjoy the spectacular living wall hanging over the tank. The wall was designed and produced by California-based Habit Horticulture. 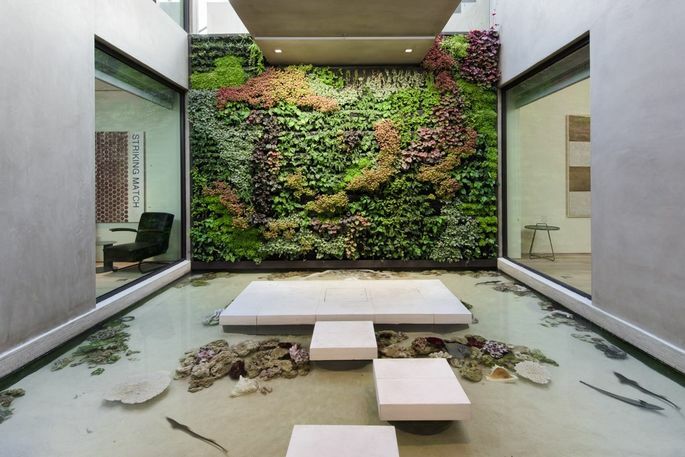 The living features on the wall include copper-velvet shamrocks, coral bells, spike moss, button ferns, and cranesbill flora to help regulate the interior temperature—helping to decrease energy consumption. With 12,000 square feet of living space, the Shark House features two pools, seven bedrooms, and 11 bathrooms. as well as a full-on health center to work off any empty calories. The master suite in the Shark House not only has huge his-and-hers closets, but a lavish bathroom with an open double shower. 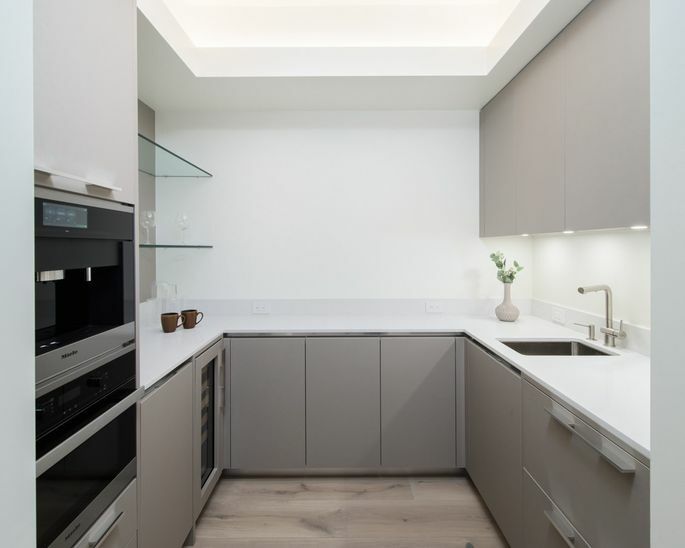 In addition, the suite has its own office, a 500-square foot deck, and a full kitchen with a luxury appliances, including a wine refrigerator, mini dishwasher and a built-in espresso machine. “People walk in and say, ‘I’d never have to leave this bedroom,'” Real laughs. I Know I never would. As the new ownerof the Shark House might want to venture out of the master suite long enough, however, to enjoy a vintage from the 500-bottle wine cellar, puff on a cigar in the custom humidor room, linger in the 25-person spa, or perhaps watch a film in the theater that seats up to 30 people. Real says that Fakheri purchased the property in 2014 for $4.75 million, and has been working on it ever since. The gleaming stone interiors were locally made by Concrete Collaborative, and are of the same stone used at the Getty Museum. There are marble and travertine fireplaces, and the cabinetry was custom-made by Aran Cucine, an exclusive Italian cabinet manufacturer. 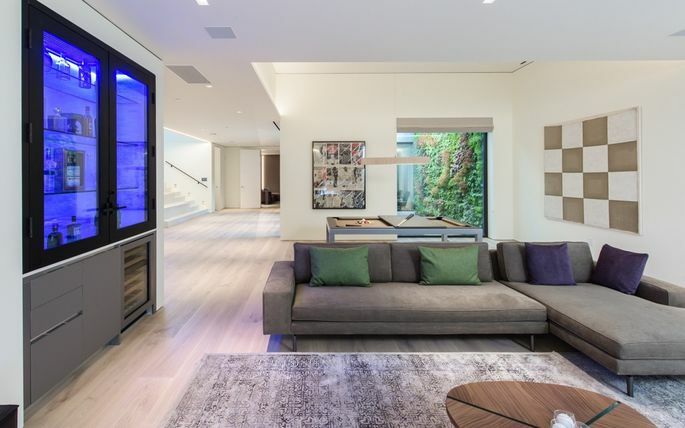 “This home is unlike anything else in the Bird Streets,” says Real, mentioning the posh area that has been home to celebs including Leonardo DiCaprio, Meryl Streep, and Keanu Reeves. And if you fall in love with the furniture in the place, fear not. 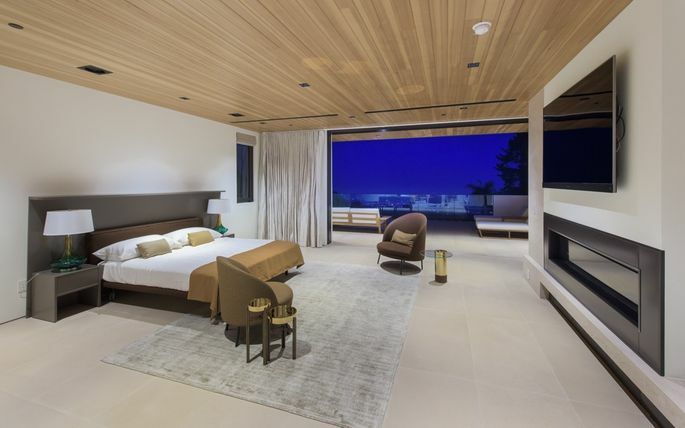 All furnishings are included in the $35 million price tag. For more info and photos on the Shark House, see my feature on Realtor.com.